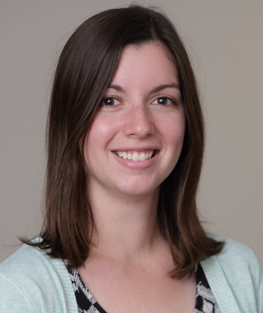 Lauren E. McGee joined NCATS in 2014 as an Intramural Research Training Award (IRTA) post-baccalaureate student after spending summer 2013 as an intern at NCATS working on the enzymatic functions of USP2 in several cancer lines. She previously interned for two summers at Eli Lilly and Company, including in the Laboratory for Experimental Medicine. While at Eli Lilly, McGee worked on immunogenicity of clinical-phase drugs, determining antibody responses to the drugs from serum samples of clinical trial patients and healthy volunteers as well as developing assays for the screens. Her research experience includes running several different assays and types of equipment targeted for high-throughput screening. McGee received her B.A. in biology from Hanover College and plans to attend graduate school at the end of her time at NCATS. McGee’s areas of interest include cancer biology, immunology and microbiology. She currently is involved in developing 3-D cell cultures for ovarian cancer lines and running compound screens for castration-resistant prostate cancer that target exosome biogenesis, secretion and uptake.